After a fire, burglary or another event in which you lost possessions from your home, it may be difficult to remember the details of every one of the belongings that you have accumulated over the years. In this situation, having a current inventory of your possessions, including make and model numbers, may help you with any potential insurance claims. Taking the time to document your belongings now can help you recover faster after a loss. 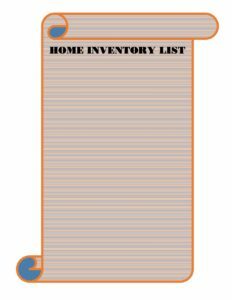 Here are some steps you can use to help build your home inventory checklist. Step 1: Take the Time to Walk Through Your Property. Compiling a comprehensive home inventory takes time and effort. The more detailed your inventory, the more useful it will be if you have to make a claim. Document possessions inside your home and on your property that may be of value. Step 2: Keep Your Inventory in a Safe Place. Creating a digital home inventory and storing it off-site will help ensure that it won’t be lost, stolen or damaged during any disaster at your home. You can also create a photo or video inventory and upload it to a cloud-based service. First, take a picture of relevant rooms or items. Label pictures of rooms and important individual items with a description, including where you bought it and the make, model and serial number. Don’t forget to inventory items that may be out of sight in storage closets or drawers. Second, walk through your home or office using your phone to shoot video of the contents, describing them as you go. Finally, digital home inventory programs allow you to upload multiple photos of each item, including photos of the serial number, receipt and other identifying details. If you choose to create a paper version, consider storing it off-site in a safe deposit box. Step 3: Update Your Inventory Often. When you make a significant purchase, add the information to the inventory while the details are fresh in your mind. This is also a good time to delete items that you have replaced or no longer own. Step 4: Remember Your Business Assets. While most people think of their home when making an inventory, it is important to document the contents of your business, if applicable, as well. Step 5: Consider Valuable Items. Valuable items like jewelry, art, and collectibles may have increased in value since you brought them into your home. Check with your agent, if you have one, to make sure that you have adequate insurance coverage for these items as they may need to be insured separately. Consider putting jewelry or other valuables that you don’t often wear or use in a safe deposit box.